The nucleus is the ‘command centre’ of the cell and houses DNA. Healthy cells in the body usually have only one nucleus (also known as mononucleated): see image above. This is especially true for developing embryos. Once normal fertilisation has been confirmed, the normally fertilised embryo(s) will continue to be cultured. The embryonic cells, which are scientifically referred to as blastomeres, within these embryos will begin to divide approximately 42-72 hours post insemination through a process called mitosis. When this process fails, as seen above, the resulting cell will contain more than one nucleus and is known as multinucleated blastomeres (MNB). This is seen in the image below. 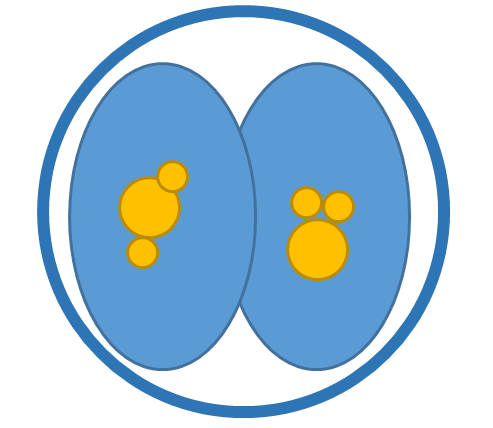 On the left is a normal 2-cell embryo showing one nuclei in each cell. On the right, is an abnormal embryo with MNB. It is not uncommon for embryos to have MNB, with studies suggesting that it occurs in approximately 17-74% of all embryos and it is not significantly correlated with age. 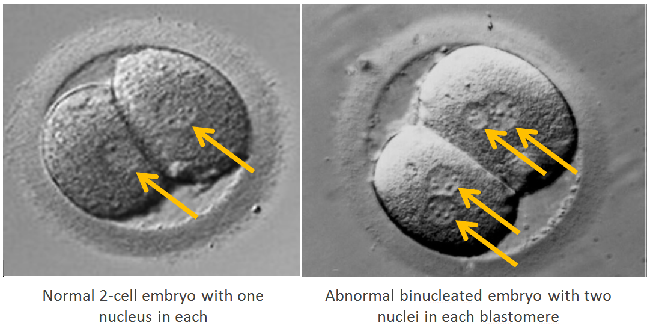 It is more commonly seen on Day 2, in 2- to 4-cell embryos, as the cells are still large making the nuclei easier to spot, however it can also be observed on Day 3 to a lesser degree. 1. 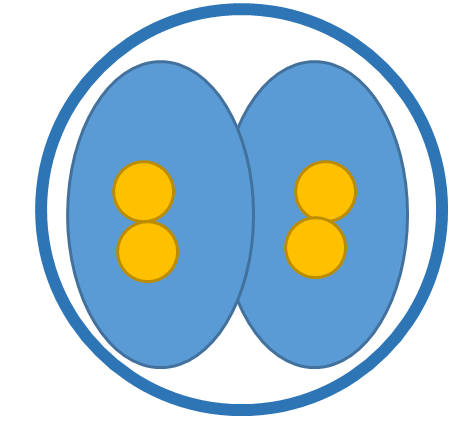 Binucleated (BN) – embryos that have two nuclei of the same size in one or more cells of the embryo. Some studies suggest that BN embryos showed similar rates of blastocyst development as ‘normal’ mononucleated sibling embryos. BN embryos also showed higher rates of ongoing pregnancy and lower rates of spontaneous miscarriage than micronucleated embryos. 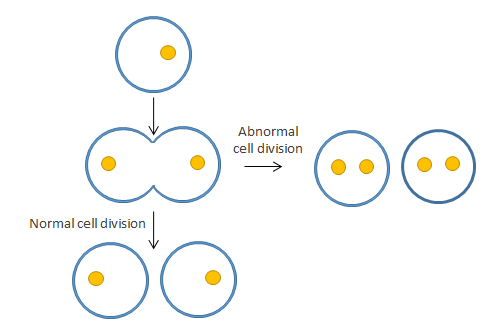 It has been hypothesised that normal cellular division can resume with BN embryos, and may therefore mean there is a chance of resumption of normal development. Also, due to the early embryo’s ability to divide and become any cell type in the body, a healthy pregnancy may derive from one ‘normal’ mononucleated blastomere in a 2-cell embryo, as the embryo may ‘disregard’ the abnormal BN blastomere if it fails to divide. 2. Micronucleated (MN) – embryos that have one or two large nuclei, with one or more smaller nuclei in one or more cells. Studies report that MN embryos showed the lowest rate of implantation and ongoing pregnancy of all the types of multinucleation. This trend also extends to the ‘normal’ mononucleated sibling embryos, which also showed a decreased rate of implantation and pregnancy. This suggests that instead of largely being oocyte dependant, that it could be a sign of a more general biological defect, affecting the entire cohort of embryos. 3. 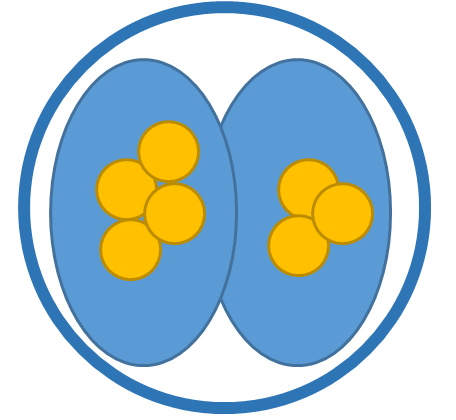 Multinucleated – embryos that have more than two nuclei of equal size in one or more cells. This form of multinucleation would most likely have similar outcomes to those listed in BN. MNB don’t usually continue to develop and therefore embryos with one or more MNB are expected to be developmentally incompetent. This can mean that they are slower to reach important embryonic developmental milestones or simply stop dividing altogether (arrest). Studies show that those MNB which continued to develop, had a higher rate of chromosomal abnormalities, with genetic testing focussing on X, Y, 13, 18, 21 chromosomes. As a result, it is recommended that these embryos are excluded and not transferred. There are very few journal articles detailing the consequences of transferring multinucleated embryos, due to most clinics choosing not to transfer these types of embryos. In cases where patients have no other embryos to transfer, some types of multinucleation have been shown to have a slightly more favourable outcome. The few cases of documented outcomes from the transfer of only multinucleated embryos involve 52 patients and indicate that the live birth rate is approximately 10%. Use of these embryos within a patients cycle are therefore still under discussion at a clinical and management level within Fertility Solutions/Affordable IVF, as outcomes aren’t clear and it is difficult to make specific recommendations based on the limited data available. Currently limited use for transfer or freezing is recommended and decisions would be made on a case-by-case basis depending on the type and frequency of the multinucleation observed. Balakier, H., and K. Cadesky. ‘The Frequency And Developmental Capability Of Human Embryos Containing Multinucleated Blastomeres’. Human Reproduction 12.4 (1997): 800-804. Web. Kligman, I. et al. ‘Fertilization And Early Embryology: The Presence Of Multinucleated Blastomeres In Human Embryos Is Correlated With Chromosomal Abnormalities’. Human Reproduction 11.7 (1996): 1492-1498. Web. Meriano, James et al. ‘Binucleated And Micronucleated Blastomeres In Embryos Derived From Human Assisted Reproduction Cycles’. Reproductive BioMedicine Online 9.5 (2004): 511-520. Web. Pelinck, M. J. et al. ‘Embryos Cultured In Vitro With Multinucleated Blastomeres Have Poor Implantation Potential In Human In-Vitro Fertilization And Intracytoplasmic Sperm Injection’. Human Reproduction 13.4 (1998): 960-963. Web. Pickering, Susan J. et al. ‘An Analysis Of Multinucleated Blastomere Formation In Human Embryos’. Molecular Human Reproduction 1.5 (1995): 254-264. Web. Varghese, Alex C, Peter SjoÌˆblom, and K Jayaprakasan. 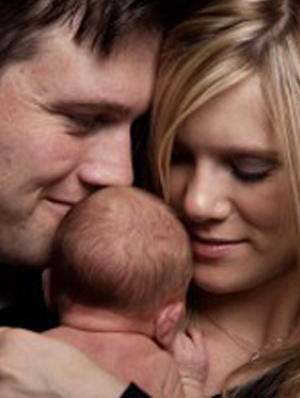 A Practical Guide To Setting Up An IVF Lab, Embryo Culture Systems And Running The Unit. Print.